What’s the point of winter – whether of the soul or of the seasons? You are here: Home / Yoga Articles / Starting • The Foundations of Yoga / The Foundations / What’s the point of winter – whether of the soul or of the seasons? Driving into Wellington there’s a big billboard by the docks that reads, “Cancel Winter.” It’s advertising warmer climes, in this case, Nelson. I know we can travel and many with means become snowbirds following the warmth of the sun around the globe. Yet I wonder if we’re missing something crucial by avoiding the dark and the cold and the seemingly difficult. I’ve lived in equatorial countries and the monotony of sun and heat most days for most of the year is not enough to keep depression or lack of purpose at bay. It’s almost worse when you feel dark and gloomy in bright weather. What’s the point of winter – whether of the soul or of the seasons? Why go into the dark, undercover, underground? Because it’s a balance to the light. Both are needed. Seeds are planted and grown in the dark, cold earth and in the dark, warm womb. Light, movement, sound, and heat are all stimulating – in yoga and Ayurveda terms, rajassic and pittic. Autumn winds and rain tear all but the bare essentials away so we can get back to the bones of who we are in Winter. There’s a death. Leaves and last fruits fall and the abundance of harvesting comes to an end. Now is the time to hunker down, be still, and let die what “no longer grows corn” as the First Nation people say in the Americas. Be brave in the dark night. Get curious – find out what is at your core. What stirs and wants new life? What is dross that “no longer grows corn” for you and that takes up the resources needed to plant something fresh? It’s only in the relative stillness that we can see the restless life within us that wants to expand, or be released for good. It’s only in the relative dark that we can see the light. Why are we so afraid of stillness, silence and the dark? Because we live in a society that rarely discusses death in a healthy way. Sure, it’s emblazoned across the headlines nearly every day, but that only makes us, consciously or not, more fearful of the only guarantee we have in life – that we will someday die. This fear builds and broadens until we fear and resist changes of location, job, relationships, ages and even seasons. How can we develop a healthier relationship to the seasons, of our year and of our Selves? By accepting them and going into them with courage and curiosity. What we call depression may just be the widespread symptom of a society that refuses to go into the dark, feel it and allow it, and trust that it’s a season with a reason. Ever-ebullient up-ness is not sustainable. Let’s cultivate greater respect and room for down-ness. A friend described depression in a way that is very close to its etymological roots; she sees it as allowing herself to be pressed down–de-pressed–so that she has more spring to rise up and expand out. But if she/we repress the need to de-press, then that button in us is liable to get stuck–and then we get stuck. I tend to turn “depression” on its side and see it as pulling back the bow. For me the confusion, lack of direction, dim thinking and heavy feeling that many people call depression and yearn to medicate or stave off, is important terrain and a key time. It’s a personal season of letting die what’s done and feeling for direction in the dark. It’s a clumsy, awkward time. I don’t know which way I’m headed so I’m looking all over the place, listening for what calls me but often getting confused between what I truly want and what I think others want me to want. 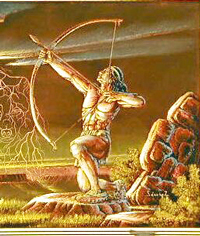 To come back to the bow and arrow image, instead of seeing myself sinking, I feel myself pulling back. I pull back away from others and even away from my own established identity/roles/responsibilities. This is the pulling back the bow part. I pull back behind where I’ve been and even who I’ve been in order to set up a new direction. Determining which arrow to pull back – which part of mySelf I want to project – is part of the confusion, but so is determining which direction to aim towards. They’re linked obviously. The clearer I am as to which aspect I want to focus on developing my ability to strengthen, the clearer the trajectory that will enable me to do that – and the target that will tell me I have done that. Recently, this winter and in my own personal winter, I’ve found the most difficult part has been the energy and commitment needed to pull back the bow that last crucial inch (or metric equivalent!). If you’ve ever tried archery the more you pull back the more strength it takes to pull back more. And the more you pull back, the more force is behind the movement of the arrow forward, so that last little inch requires every last little bit of strength you can muster and still keep steadiness and aim. Today in New Zealand is Winter Solstice – a day of hope for people throughout time. It’s a day of recognizing the power of the dark days and the welcome power of the sun to illuminate and warm our world. May you find that which lights you up, pull back your bow of intention and let fly your arrow of conscious action in the world. And may you trust in the wisdom of the seasons, all of them! 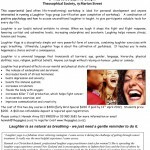 This experiential (and often life-transforming) workshop is ideal for personal development and anyone interested in running a Laughter Yoga group. Hi Melissa, thank-you for sharing. I would like to share something with you that ties in with the strength required to pull back that bow that allows you to hit your attended taget. I recently visited a rifle range (first time with a work colleague), and during that short time at the rifle range I found that my breathe was the key , the focus that it gives for the strenght to hold the gun steady and aim straight and slowly pull the trigger – he was pretty impressed since he had been shooting for a while. Amazing because it related back to what i have experienced so far with yoga and the breathe and how it truly does apply to everyday life for calmness and focus! PS: We did not shoot any living things :-). Enjoy the rest of what Winter has to offer. Thank you for your story! I love shooting too! Not things or critters, but for the sake of the practice & it is very “zen”. I’m looking forward to getting up to the indoor range for riflery & archery here in Wellington soon. Thanks for reading & I hope you discover other surprise ways of applying your yoga practice off the mate! The opportunity to find things on your back door here in New Zealand that are outdoors is great! One other practice that i have found off the mat that might be of interest to you or readers is free diving – snorkling not deep , it requires you to be relaxed resulting in a better hold breathe when you dive down and explore, supported by the tranquility of the water and visual – unbelievable! Only began here in Wellington also 2yrs ago and with the amount of shoreline , and marina, abundant with sea life in close proximity – bliss! Pranayama through this method is highly addictive with slow movements! Great for both body and mind and at one with your breathe, jn fact that is all you can hear when your in the water. Those interested check in with the many specialist dive shops in your local area for beginners advice.